The term “tolerance” from an immunological perspective, broadly encompasses a number of phenomena, but generally refers to a diminished responsiveness to LPS and/or other microbial products. With the discovery that many of the immunological, physiological and/or pathophysiological effects of LPS can be attributed to the lipid A moiety of the LPS molecule, a number of different lipid A analogs were synthesized with the goal of developing a drug that could be used clinically to treat cancer. 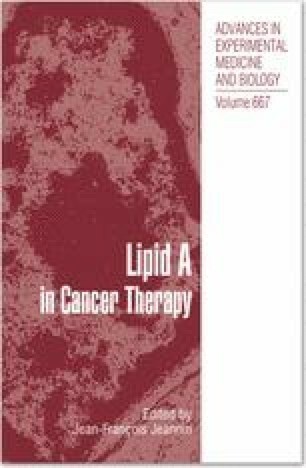 In many instances, the development of tolerance to the lipid A congeners confounded the utility of these analogs as cancer therapeutics. In certain circumstances, however, the development of tolerance in patients has been utilized therapeutically to protect immunosuppressed patients from sepsis. Although numerous studies have been designed to investigate the development of tolerance, the underlying molecular mechanism remains unclear. This may be due, in part, to differences in the experimental models used, the sources and types of microbes and microbial products studied, kinetics of responses, and/or other experimental conditions. Nonetheless, a number of different signaling pathways have been identified as potentially modulating and/or triggering the development of tolerance. Though complex and incompletely understood, the capacity of tolerance to impact lipid A-based therapeutics, either positively or negatively, is inarguable, thus underscoring the necessity for further investigation toward elucidating the mechanisms contributing to the development of tolerance to lipid A and its analogs.